5 Royales | Russ & Gary's "The Best Years of Music"
Gary: As Jimmy Castor opened Troglodyte with “Let’s go back, Let’s go way back” , I will take you back to the early 50’s and an R&B Group that never cracked the Billboard Charts, had only a few #1 hits on the R&B Charts, but recorded 3 songs that would be recorded many times over. Their guitarist wrote “Dedicated to the one I love”, “Think and Tell the Truth”. They were significant because without them, The Shirelles and Mama’s and Papa’s would not have those big hits. 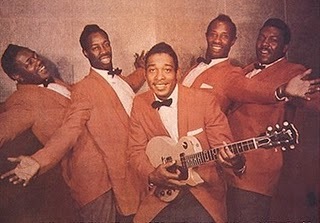 The “5” Royales was a rhythm and blues (R&B) band from Winston-Salem, North Carolina, U.S., that combined gospel, jump blues and doo wop, marking an early and influential step in the evolution of soul music. Most of their big R&B hits were recorded from 1952 to 1953 and written by guitarist Lowman “Pete” Pauling; later cover versions of the band’s songs hit the Top 40, including “Dedicated to the One I Love” (The Shirelles, the Mamas & the Papas), “Tell the Truth” (Ray Charles), and “Think” (James Brown & The Famous Flames). Brown modeled his first band after the “5” Royales, and both Eric Clapton and legendary Stax guitarist Steve Cropper cite Pauling as a key influence. Rolling Stones singer Mick Jagger covered “Think” on his 1993 solo album Wandering Spirit. 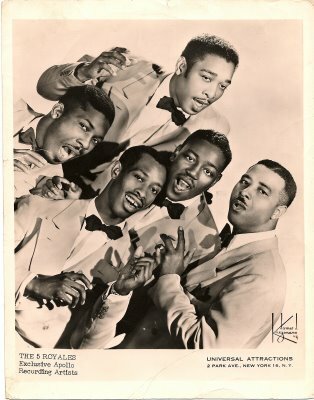 Originally called the Royal Sons Quintet, the group began recording for Apollo Records in the early 1950s, changing its name to the Royals after abandoning gospel for secular music. The group paired Pauling with vocalists Jimmy Moore, Obadiah Carter, and Otto Jeffries, with Johnny Tanner (28 November 1926, North Carolina – 8 November 2005) singing lead. Later Tanner’s younger brother, Eugene, would replace Jeffries. The robust Johnny Tanner sang lead on most of the group’s hits, including “Think,” although the sweeter-voiced Eugene Tanner stepped to the microphone for the group’s best-known song, “Dedicated to the One I Love.” “Baby Don’t Do It” and “Help Me Somebody” became hits in 1953, but the group soon signed to Cincinnati’s King Records. In addition to heartfelt odes like “Dedicated to the One I Love,” Pauling also wrote comic and risqué tunes, including “Monkey Hips and Rice,” later the title of a two-CD anthology of the group’s music released by Rhino Records in 1994. Pauling used an extra-long strap for his guitar, sometimes playing it down around his knees for comic effect. The group shared stages with all the major R&B artists of the 1950s, including Sam Cooke and Ray Charles, once substituting for the latter’s Raelettes at a show in Durham, North Carolina. Confusion arose when two groups of Royals began touring, the other led by Detroit R&B legend Hank Ballard. According to members of the “5” Royales, the confusion peaked in 1953 when an unscrupulous promoter booked Ballard’s group in Winston-Salem, trying to pass the Detroit band off as its native-son namesakes, much to the chagrin of a local audience. Shortly thereafter, the air cleared when Winston-Salem’s Royals became the “5” Royales and Detroit’s Royals became The Midnighters. Ironically, both artists would have hits at King working with Rock & Roll Hall of Fame producer Ralph Bass, becoming good friends and routinely competing in battles of the bands at clubs like Atlanta’s Royal Peacock in that city’s Sweet Auburn section. With King, “Think” and “Tears of Joy” became hits for the “5” Royales in 1957, while some of their lesser-known tracks from this period are now critically acclaimed as innovative. Veteran rock critic Dave Marsh chose the 1958 “5” Royales hit “The Slummer the Slum” as one of the top 1001 singles of all time in his book The Heart of Rock and Soul, crediting Pauling with capturing the first intentional use of guitar feedback on record, years before better-known squawks from the Beatles, Yardbirds, and Velvet Underground. 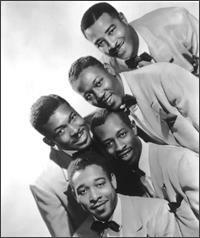 In the 1960s, R&B gradually gave way to more polished soul music and the Royales’ career waned rapidly. The “5” Royales broke up in 1965, though various combinations of musicians would tour under the group’s name into the 1970s. For a time Pauling continued recording with pianist and frequent Royales collaborator Royal Abbitt as El Pauling and the Royalton. Pauling’s brother, Clarence Paul, a former member of the Royal Sons Quintet, found success as a producer and songwriter at Motown Records in the 1960s. Most of the group’s members survived well into the 1990s, but not Pauling. After years of struggle with alcohol dependency, he ended up working as a night watchman at a Manhattan church and died of an apparent seizure on December 26, 1973. The “5” Royales were inducted into the North Carolina Music Hall of Fame in 2009. They have been previously nominated for the Rock and Roll Hall of Fame in 2002 and 2004 without getting in they could be nominated again in 2012. This entry was posted in music, Retro, WPaudio. Bookmark the permalink. Great post, and amazing music! Thank you, Mr.Casebier. Gary and I really appreciate your positive feedback. Thanks so much, Commissioner, for the honourable mention on your show! That is an honour, indeed and we are so glad you liked this post. The only time I heard their records was back in 1955 on the American Forces Network radio station when I was stationed with the RAF in Germany. My mates had never heard of the when I came back to England.